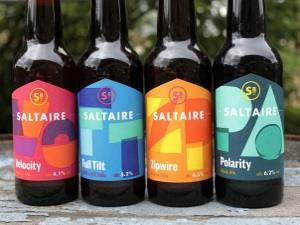 Saltaire Brewery & Tap Room01274 452098work ShopAt Saltaire we’re passionate about how we make our beer – it’s the only way we know how and we’ve been doing it since 2006. We brew with pride and stay true to who we are. We don’t compromise on quality. Established in Shipley beside the Leeds and Liverpool canal and close to the UNESCO World Heritage site of Saltaire, we’ve brewed our way into Yorkshire hearts and beyond. Whether it’s Triple Choc, our multi award-winning speciality stout, or Velocity, our deliciously citrusy and refreshing session IPA, our aim is always to create exceptional beer. Visit our onsite Tap Room and Shop to try our beers on tap and to buy a range of beers to take home. Open six days a week, it’s dog friendly and bike friendly (you can even fix your bike at our tool stop), making our large beer garden a favourite destination for refreshment after a dog walk or bike ride along the canal. Or come along to our monthly Beer Club, usually held on the last Friday - where we showcase our own cask beers as well as a few guest brews. We always have a hog roast and often a guest street food stall. To join us, tickets are available on Eventbrite. We’d love to see you, and guarantee a warm welcome! At Saltaire we’re passionate about how we make our beer – it’s the only way we know how and we’ve been doing it since 2006. We brew with pride and stay true to who we are. We don’t compromise on quality.